Inspired by Mr. Rogers when she was a toddler, Peyton Hayslip roamed the back yard of her home making up “operas” and singing stories. By the time she was 6 years old, she was adapting her favorite stories into plays and directing her young friends. It was no great shock that she would go on to study acting at The Juilliard School when she was older; she seemed born to perform. That education led to more roles in the theater, film, TV, and a plethora of voice over projects. But one art is never enough! As an adult, in addition to acting, she revisited an early love of photography, and began developing a form of sculpture akin to tramp or folk art using straight pins and vintage beads and jewels. 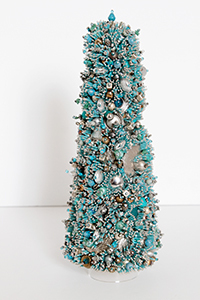 Her beaded creations began in the mid-nineties, starting out as Christmas ornaments; they have evolved into complex shapes including skulls, trees, topiaries, and furniture completely encrusted with antique, vintage, and new jewelry, and millions of glass seed beads. Each piece is a labor of love, some pieces taking more than six months to complete. Commissions from her clients not only serve as a unique way to preserve beloved heirlooms, but are beautiful works of art. Assemblage Materials: Vintage and new jewelry (brooches, earrings, bracelets, pendants), vintage beads, found objects, art glass, glass seed beads. Tell me a little bit about you, mission statement if you have one and/or a quote that speaks to why your feet hit the floor in the morning? I tend to be inspired by the little things. A flower blooming, the march of ants, something silly my dog does, the fantastic imaginations of my young grandchildren; that may explain the tiny detail work of my sculptures. Each bead, each bit of jewelry, each color is specifically chosen for the piece I am working on. I am instantly inspired by the sun hitting a piece of crystal hanging in a window, or by the smell of coffee…. if I’ve remembered to set “auto-brew”! There is always something new to discover. What is the most important thing in your work? The selfish answer is: that it is fulfilling to me. It’s fun to do. I’m happiest if I can spend the day deciding where pieces of jewelry will be best highlighted on the piece I’m starting. When I am immersed in a project hours fly by. My workbench is in front of a window which looks out on to the street of my neighborhood…. I am sometimes surprised to realize I’m seeing a neighbor I saw leave for work RETURNING from work because I’ve been so focused all day. The OTHER answer, though, is that I love to tell stories with each project. A table may hide antique watches, and romantic brooches, or earrings… these thing say something about the piece… but one has to study it to determine what the story is…. and I guarantee the story will be different depending upon the observer. The skulls I create have more specific narratives. I was inspired by the jeweled skeletons of the “catacomb saints”. 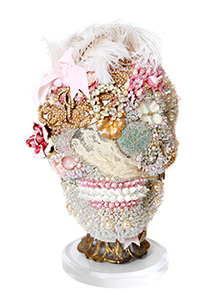 (https://www.smithsonianmag.com/history/meet-the-fantastically-bejeweled-skeletons-of-catholicisms-forgottenmartyrs-284882/) I started thinking about beheaded royals of the past, and wondered what they might look like had they received the same treatment. The Boleyn Skull was the first skull, La Tête de Marie Antoinette was next. There are more jeweled skulls planned! What do you hope is the take away from it? What is the most challenging part of your career so far, and how do you overcome challenges? Making money as an artist! 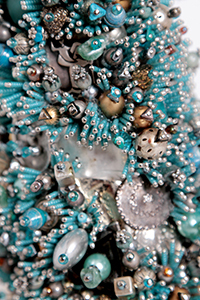 Various incarnations of my beaded work have been happening since 1992. I was very fortunate at that time to have a devoted client who bought almost everything I could make. To this day, she continues to add to her collection, and I can say without a doubt that she has the largest collection of my holiday pieces that exists. However, it took me a long time to understand the BUSINESS of being an artist (I’m still learning). As an artist, it’s so difficult to look dispassionately at my work. It’s hard to say, “Well, this will take me this many hours, so that’s going to cost X dollars per hour, therefore this piece will have to cost X dollars per square inch.” My more savvy business friends try to explain to me that it really does need to work that way from a cost basis. I agree, and I DO have a formula for my pricing (based on size, and intricacy, cost of elements, and time), and I use it, but there is a little wiggle room to think about when I may start a piece, and then have to step away from it for a bit while I gather more supplies or think about the direction of the piece. I’ve also been asked a number of times why I don’t just design the pieces and then send them off somewhere to have the work done inexpensively) by others. To me, doing the work IS designing the piece. I sometimes change directions mid-stream… it would be difficult to tell a group of artisans to make that shift for me…. but I’m still thinking about how I could streamline my process. I’d never say that I’d never get help. I just still need to wrap my head around how to do that. Each piece I make is unique, and a piece of art, not something mass-produced. I like that. If you could go back in time and change something, what would it be and why? I don’t think I’d change anything. It definitely hasn’t been smooth-sailing, but I have found, repeatedly, that innovation comes by way of challenges encountered. Every piece I build starts with a certain amount of engineering work. How can I make this piece hang just right? How will this thin part support this thicker part? 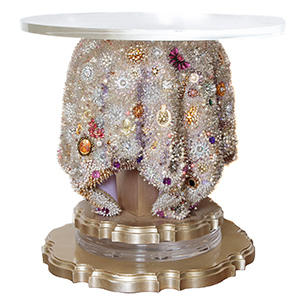 How can I make an encrusted table look draped? Sometimes, I have to step away and think about it for a bit. Sometimes, I attempt a solution and it fails. Sometimes, completely by chance, I hit on just the right solution. One beaded ornament that I made around 1995 as a gift for my grandmother returned to me after she died in 2004. I was, and still am, pretty pleased to see how lovely it still is, but I am also pleased with the changes I have made to my process since I made that little piece. Any awesome women out there that are inspiring you? 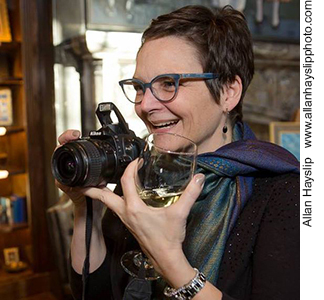 Within my own field, I love to watch Betsy Youngquist (@betsyyoungquist), Katrina Doran (@katrina_doran_mosaics), and Susan Wechsler (@mosicsbysusan). But I am continually inspired by women all over the world who are, to paraphrase Joseph Campbell, “following their bliss”. I am daily inspired by young women who are taking the bull by the horns and making their lives happen exactly as they want it to be. I think I was too timid when I was a 20 and 30-something. Today, most of the young women I know are so brave, and strong, and smart… this includes both of my own daughters. They are astounding. What's a message you hope you are sending to women who are watching you? Gosh. It’s difficult to imagine women watching me. But if they are… I hope that they will remember it is never too late to do anything. Take time to ponder, imagine, study tiny things, take what I like to call an Urban Safari, and photograph your own neighborhood, or even your own house, then study those photos, and your environment. You might be surprised by the inspiration in your own backyard. 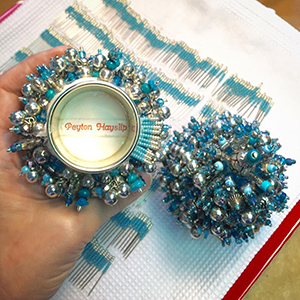 See more of Peyton’s work @phbeadworks on Instagram.